LISBON, Portugal — Portugal began three days of national mourning Tuesday over its 37 fire deaths amid widespread public anger, with pressure growing on the government to explain why officials failed to prevent the tragedy that came just four months after 64 others died in another fast-moving blaze. Rain and lower temperatures on Tuesday helped emergency teams in Portugal and Spain bring under control most of the forest fires that killed at least 41 people over the weekend. Portuguese authorities reported that almost all major wildfires were out by Tuesday morning. Some 2,700 firefighters were deployed to prevent re-ignitions in the country's smoldering forests. In northwest Spain, where four people died in wildfires, regional authorities in Galicia said 27 forest fires were still out of control. Investigations were underway to find the cause of the late-season wave of hundreds of forest fires, which Iberian officials blamed mostly on arsonists and freak weather conditions. Temperatures on the Iberian Peninsula exceeded 86 degrees Fahrenheit over the weekend and the area was raked by high winds as Hurricane Ophelia churned past in the Atlantic. Spanish Interior Minister Juan Ignacio Zoido said some of those responsible had already been identified. They could face up to 20 years in jail if convicted. And at least two people were also arrested in Portugal for allegedly starting fires. 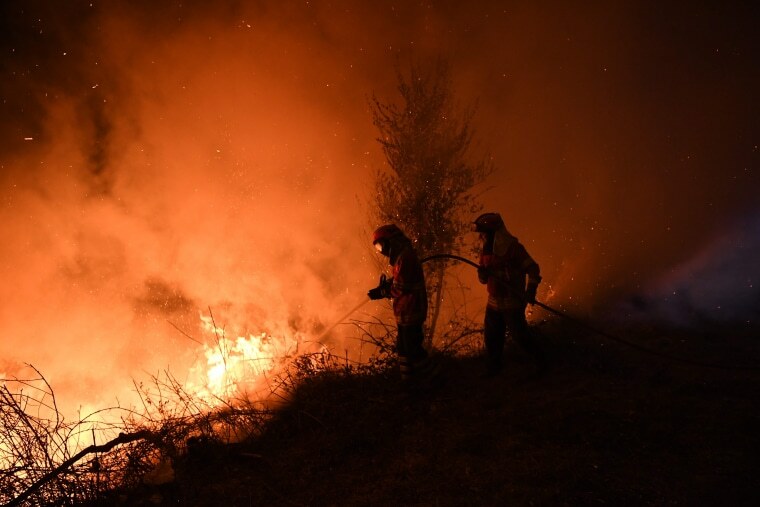 "We are ready to extinguish fires, but we are not ready for arsonists," Spain's Environment and Agriculture Minister Isabel Garcia Tejerina told public broadcaster TVE. Television video showed abandoned villages with many houses in embers and charred vehicles left on the roads. In Portugal, opposition parties rebuked the government for what they called a lack of preparedness. The Civil Protection Agency's full firefighting contingent operates only during the traditional peak wildfire season, which runs from July 1 to Sept. 30. In October, its firefighting assets are reduced by half. Critics say the state of readiness must be more flexible, especially when Portugal is gripped by drought and its weather patterns are affected by climate change. Prime Minister Antonio Costa, who has rejected calls for members of his government to resign over the fire deaths, called a special meeting of his Cabinet for next Saturday to discuss firefighting measures. But public outrage is simmering. Local governments in the worst-hit areas, aided by a social media campaign, are organizing silent street protests in Lisbon and in their own towns and cities to coincide with the Cabinet meeting. In Galician towns on Monday, angry locals chanted "Never again!" to protest the deadly wildfires.